I have always loved the game show “Family Feud.” From the comfort of my living room couch, I am pretty good at it, too! If they were to survey 100 people about occasions where cake is served, birthday’s would HAVE to be at the top of the list. I would slap that button so hard! My life seems to have revolved around birthday’s lately. In the past two weeks, I have helped celebrate 7 birthdays. SEVEN. So, I thought I’d do a birthday cake round-up here on the blog. First up is the cake that I made for my husband’s birthday. Technically, this was also my birthday cake, as we are three days apart, so we celebrate our birthdays together. Ryan has been the biggest supporter of Four Oaks Bakery since before it even existed and he believes so much in what we do. I say “we” because I couldn’t do this without him. He takes care of the majority of the business end of things and also steps in to mix up batter, color fondant, and do other things to help me so that I am not up at all hours of the night every night. That being said, I knew without a doubt that I would make whatever cake that he wanted for his birthday. 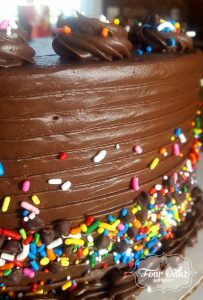 He chose his two favorites–almond cake and chocolate cream cheese frosting. I’d never made this particular combination before, so I wasn’t quite sure what to expect, but it was awesome! Ryan requested the flavors and I took artistic liberties with the decoration (sprinkles everywhere!) and loved everything about this cake. It made me happy! Isn’t that was birthday cake is supposed to do? Later that week, a 13 year old requested her favorite for her birthday, red velvet cake with cream cheese filling. 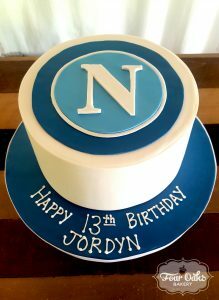 This young lady is a huge soccer fan, so when her mom sent me a picture of what she wanted on the cake, I safely assumed that it was soccer related, and I was correct. I was more than happy to honor Jordyn with a cake featuring the logo of her favorite soccer team is S.S.C. Napoli from Italy. This cake was covered in fondant and topped with a hand cut fondant logo. In keeping with the sports theme, next we have Josh’s 6th birthday cupcakes! My boys were actually attendees at this birthday party and it was a complete blast! The party was held at a gym with trainers who had all sorts of activities for the kids to participate in–various stations (including a climbing wall and trampoline! ), relay races, tug of war, and more. My oldest son has already requested that we have his 7th birthday party there. He’s not even 6 yet, ha ha (more on that next week)! Josh’s mom wanted the cupcakes to be sports themed to match the location and activities at the party and I think she was totally on track. 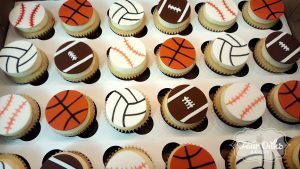 The cupcakes were topped with fondant circles decorated to look like baseballs, footballs, basketballs, and volleyballs. So fun! 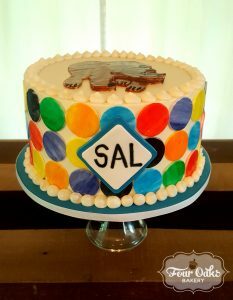 Our next birthday cake was for a handsome 2 year old named Sal. His mom planned a fabulous “Brown Bear, Brown Bear” themed party for him, compete with a GIANT Brown Bear cutout. I was so excited to do this cake, as I love all things Eric Carle. I knew from the get go that I wanted to hand paint white fondant in all of the colors that are mentioned in the book and then cut out circles to use all over the side of the cake to mimic the illustrative style of Eric Carle. 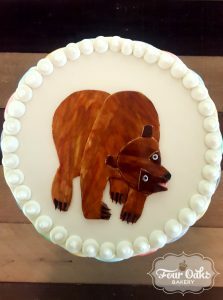 Ryan really helped me out on this cake by doing all of the painting and then hand cutting and assembling Brown Bear while I layered the chocolate cake with peanut butter buttercream filling (yum!) 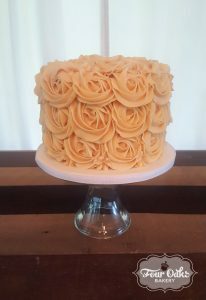 and frosted it in vanilla buttercream. If there was ever a cake that I wish that I could have just cut into and eat right there, this was it! Here’s a top view of Ryan’s handiwork on Brown Bear. He did an amazing job! My final birthday cake was for a friend of my mother-in-law. She ordered a vanilla cake with the always popular salted caramel buttercream but gave me carte blanche as far as the decoration went. I decided to go with a buttercream piping technique that I first did several years ago on a birthday cake for my mother-in-law, but not since then. It’s very popular on Pinterest and is referred to as rosettes because the swirls look like roses. The cake turns out looking elegant and sophisticated enough for adults, yet still pretty and fun enough for children. I hope that I get the opportunity to do more cakes like this! I was happy to help Ann celebrate her birthday with good food and even better friends! I have one more special birthday cake that I am working on this week–my oldest son turns 6 in a few days! I will be sharing his cake next week, so be sure to stop back and check it out!